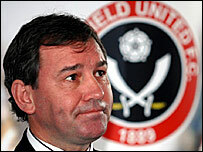 Sheffield United have unveiled former England captain Bryan Robson as the club's new manager. Robson, 50, takes over from Neil Warnock in the Bramall Lane hotseat only nine days after the Blades were relegated from the Premiership. "I'm delighted to take the position," he said. "We've got a good squad and if we can fine tune it a bit, we can get back to the Premiership." Brian Kidd moves up from his role as coach to become assistant to Robson. Is Bryan the right man to get Sheffield United back into the Premiership? Robson, who has also managed Middlesbrough, had been out of work since leaving West Brom in September. He added: "When you've been in football since you were 15, as I have, when you go out of the game, you do miss it. It's what I've always done. "The great thing about Sheffield United is the set-up. It's surprised me how solid the foundations are. "That gives you a great chance to go forward and improve the squad and hopefully get straight back into the Premiership." Club chairman Kevin McCabe said he believed Robson would lead the Blades back to the top-flight this season. "Bryan is an experienced manager. We believe he's the right man to get us back to the Premiership in the shortest possible space of time," said McCabe. "He will have every support from the board and the team here to gain that ambition because this club intends to be among top 10 in Premiership at least within the next three to five years. "Despite relegation, we're still determined to achieve those ambitions." Robson parted company with West Brom by mutual consent in September and had set up a sports consultancy business that he was reportedly reluctant to leave. But he now replaces Warnock, who spent eight years with the Blades - although McCabe has now conceded that he "wasn't quite right" for the club last season. "Hindsight is a great thing," he added. "Neil Warnock is a great motivator. We can reflect now maybe Neil Warnock wasn't quite right for our Premiership ambitions. But he gave it his all. "The time had come for a change." Robson has experience of winning promotion, having guided Middlesbrough to the top flight in 1995 and, after a relegation, in 1998. He successfully kept West Brom in the Premiership in 2005 but they were relegated last year and Robson left the club after a disappointing start to the subsequent campaign. Kidd, who joined the Blades as a coach in September, will succeed Stuart McCall as assistant manager. His previous roles include an assistant management post at Manchester United, a stint as manager of Blackburn and a job as part of former England boss Sven-Goran Eriksson's backroom staff.